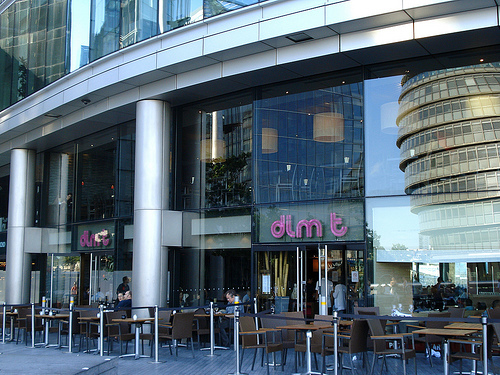 A restaurant for special occasions: Dim T More London. Easily the flagship of the small chain of cool and stylish pan-Asian restaurants, the sort of place where they play lounge music on the loos. Speaking of loos, it’s not easy to find the cabins…hint: the rear wall is not really a wall. People come here for the view, and thanks to my booking we had a prime table at the floor-to-ceiling windows, with a direct view of Tower Bridge. Brilliant view, even though we were on the ground floor – I have only ever been to the first floor so far. Sunday noon was not crowded at all, which was good, and the weather added to the perfection of this occasion. The food was good as always: Nicely steamed Dim Sum, two tasty noodle dishes for the two of us, and a shared brownie which seems to have left the menu since! So, if you have visitors or want to celebrate something, this will be a great place to do so. Ok, the menu used to be more creative a few years ago, and Dim Sum connaisseurs should go elsewhere, but Dim T does ok quality food in nice surroundings with a fantastic view, and it won’t tear a hole in anyone’s pocket. Quite surprising for this location. Definitely preferable to Gaucho and Strada next door, unless you have a voucher for the latter.